You only need to keep and eye on the clock to cook durum wheat semolina pasta to al dente and take advantage of its toothy texture. 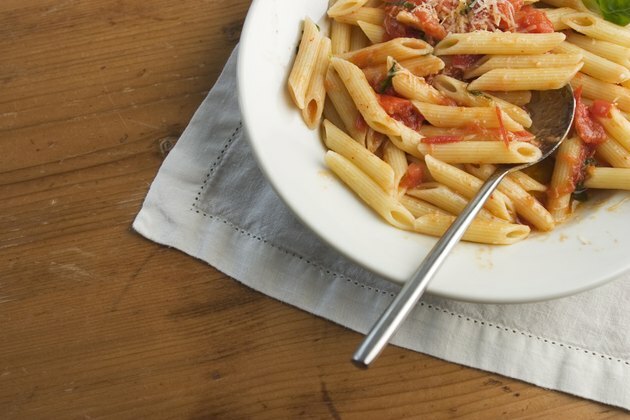 Almost all dried pasta comes from durum semolina, a coarsely ground hard wheat flour with a high gluten content. Semolina's gluten gives it the sturdiness it needs to hold up to thick sauces without losing the delicacy needed to bend and twist into complex pasta shapes. Semolina cooks to al dente better than egg-based, mixed-grain and non-wheat pastas, so make it you first choice for traditional pasta dishes and casseroles. Prepare the pasta sauce and have it hot and waiting for the pasta on the stove in a wide saucepan over low heat. Pour about 5 quarts of water in a wide pot for every 1/2 pound of durum pasta and bring it to a rolling boil. Don't worry about using too much water; you need enough water so the pasta can move around freely. Add 1 to 2 tablespoons of coarse salt for every 5 quarts of water after it starts boiling. Wait for the water to return to a boil. Add the pasta to the water. Stir the pasta until water returns to a boil, then stir a few times every minute thereafter. Boil the pasta until just before al dente all the way through -- or until the noodles have a barely perceptible crunch on the inside -- if you are going to finish cooking it in a sauce, about 5 to 7 minutes depending on the noodle. If you're going to use the pasta in a baked dish, cook it to about 1 minute before al dente, or until it almost tastes ready, but it has a definite crunch in the center. The noodles will finish cooking in the oven. Drain the noodles in a colander, reserving about 1 cup of pasta water. Don't rinse the noodles unless you're using them for a salad. The starch that coats the noodles helps the sauce stick. Add about 1/4 to 1/2 cup of reserved pasta water to the sauce, if you've made one, and set the heat to medium. Cook the sauce until it reduces enough to coat the back of a spoon and add the noodles. Stir the noodles in the sauce just enough to coat them. Finish cooking the noodles in the sauce, stirring only once or twice. Toss the pasta continuously if you have to wait more than a minute or two before adding it to the sauce to prevent it from sticking.